Do you love tomatoes and just can't imagine letting any go to waste? If you have had a productive year growing tomatoes the end of the season can feel a little depressing once you realize that those green tomatoes growing on the vine and getting larger, while the summer days are getting shorter. And there isn't much of a chance of them ripening before it's too late. So what do you do? Of course, fried green tomatoes are a must, but I'm here to tell you about the goodness of pickled green tomatoes. Take your green tomatoes and quarter them. To make things easier, I used a quart-sized canning jar for the pickling process, but you can split them into medium sized jars if needed. Next add your two sliced garlic cloves, sliced jalapeno pepper, fennel seeds, and four tablespoons of bourbon. In your saucepan, combine the water, apple cider vinegar, kosher salt, whole black peppercorns, star anise seed pods, and turmeric. Bring to a simmer until all of the sugar is dissolved and remove from from heat. 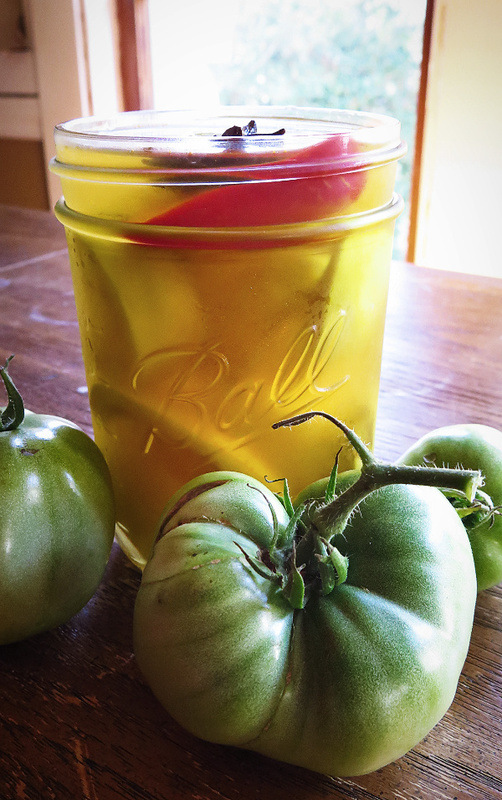 Pour your brine into the jar with the green tomatoes. Let cool, close lid and place in the fridge for at least three days to allow the tomatoes to fully pickle. They will keep in the fridge for up to 2 weeks. Serve with cheeses, cold cuts, in salads, or just enjoy a tasty, crunchy, pickled tomato. Do you often have green tomatoes at the end of the season, or do all of your ripen during summer?